(Photo Courtesy/Mike Beiermeister) The student film competition had the largest audience for the 2019 Thunder Bay International Film Festival. Alpena, Mich. — A government shutdown and extremely cold conditions couldn’t stop the 2019 Thunder Bay International Film Festival from taking place this year. Attendance for the festival couldn’t top last year, but certain events exceeded expectations. The highest-attended event at the festival was the student film competition on Saturday. “We had people lined up in the hallways, and we probably would not have been able to accommodate as many people if we weren’t at Alpena Community College because we had so many people attend that evening, ” said Wolf. Last year, only 14 students submitted films. This year the festival received 49 submissions. Hundreds packed into to watch students showcase their creations. Students came in from all over the state to watch their films on the big screen. Morning and early afternoon showings were the slowest. Wolf attributes the low attendance to the cold conditions. Evening showings were well attended. Close to 400 tickets were purchased in total. This includes “Thunder Passes” which were all-access passes that got film-fanatics into every showing. 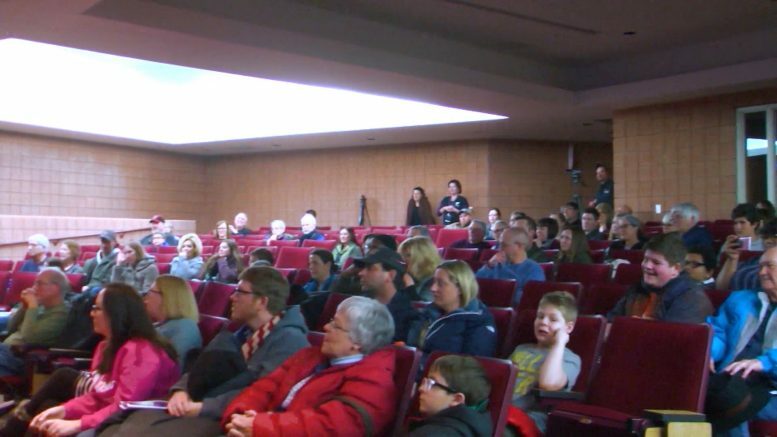 Film festival on the road also exceeded expectations despite the cancellation at Alcona Community Schools due to weather. Around 100 people watched films at the Rogers City Theater on Thursday night. This year also featured the most filmmakers in attendance. The film fest had 10 movie-makers share their work with the community.